Guitar players you should know: Tom Verlaine. A 78% score (what? a C+?) from Filter. A quick review at Blurt. 12.6.08: Whatever happened to 315 Bowery? A nice introduction to Marquee Moon from Hazel Sheffield at Gigwise. An even better introduction? Listening to Marquee Moon. A tribute to Marquee Moon over two nights in Boston, November 6th and 7th, at the Church. More information here. These performances benefit Coalition of the Willing, a organization dedicated to providing relief to Sudan. Collectors' Choice Music has made Dreamtime and Words from the Front available again on CD (sadly, with no sonic improvements over previous reissues), and a new review of both courtesy of Bill Sherman can be found at Blogspot. 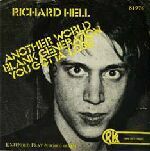 Nods for both Television and Richard Hell in a quick New York Punk Buyer's Guide. No, the Marquee Moon Mailing List is not dead -- this website is just a bit behind on updates lately! In fact, it's part of a bigger network of Television sites out there; you can read a fine piece of writing on the topic, courtesy of Ty Burr (film critic for The Boston Globe). The New Jersey Star-Ledger has a review of the TV/PS show at Roseland this past weekend. You can read it here. Columbia Records has put out a press release to promote the upcoming joint Television / Patti Smith show at Roseland Ballroom on October 2nd, noting that for Verlaine and Smith this will be "their first appearance together in New York City since 1977." You can read the full press release here. DrownedInSound.com has a fantastic review of Television's performance at Manchester Academy on July 2nd. You can read it here. The Telegraph UK has a review of a Patti Smith show at Brixton Academy for which Television was the opening act. You can read it here. Marquee Moon has an impressive (and well-deserved) #3 ranking in Pitchfork's "Top 100 Albums of the 1970s". See the whole list starting here. The Scotsman has a review of Television gig in Glasgow yesterday. You can read it here. Mojo magazine has awarded their "Classic Album Award" to Marquee Moon. Tom Verlaine and Billy Ficca were on hand to receive the award in London. As described by the BBC, Mojo's awards are "designed as a corrective to the celebrity-led, disposable here and now culture of the Brits and Record Of The Year, recognise lasting success, influence and enduring artistry." You can read about the awards, as well as Billy Ficca's acceptance speech, here. The Telegraph has an obituary of Robert Quine found here. The New York Times has an obituary of Robert Quine found here. More news about Quine's death can be found at Google's news site. Robert Quine, guitarist and co-founder of the Voidoids (among many other distinctions), has died at the age of 61. CNN (via Billboard) has a piece up here. Steve Caratzas' web site for Robert Quine is asking for any stories and/or reminiscences about Quine to be emailed here. The Toronto Eye has a brief interview with Tom Verlaine about his upcoming Music for Films performance on April 16th. You can read it here. The Toronto Star has a slightly longer interview which you can find here. Spin magazine's "My Life in Music" features REM frontman Michael Stipe, who names Marquee Moon his second favorite record of all-time, arguing at a young age that "Tom Verlaine is God". * TELEVISION, Irving Plaza, 17 Irving Place, at 15th Street, Manhattan, (212) 777-6800. Television was there at the birth of punk, though its imagistic poetry and modal jamming were not what punk would become. Tom Verlaine's songs are full of indelible riffs and open-ended thoughts, and he and Television's other guitarist, Richard Lloyd, constantly swap lead and rhythm roles and push each other toward improvised epiphanies. The band reunites sporadically and without explanation, but the old chemistry can still come through. Tonight at 9, doors open at 8; with Martha Wainwright opening; admission is $26.50 in advance, $30 on the day of the show. Like the Velvet Underground before them, Television's impact on pop will likely never be reflected in sales or wide public popularity. Yet the angular, twin-guitar attack developed by Richard Lloyd and Tom Verlaine (right) in the band's late-'70s heyday has gone on to influence several generations of bands, the latest of which (the Strokes, the Rapture) also happen to hail from New York City. For the third year running, Television will return to Irving Plaza in New York City on Thursday, March 25th and Friday, March 26th. Tickets are on sale now. Following that, they'll be playing at the Paradise in Boston on March 24th. This will be their first appearance in Boston since they played the Paradise on November 30th, 1992. Also, Tom Verlaine and Jimmy Ripp's Music For Films show will be appearing in Toronto at the Images Festival on Friday, April 16th. This will be the first Music For Films performance anywhere since December of 2002. Rocket From The Tombs, the Pere Ubu / Dead Boys forerunners who reunited in 2003 with Richard Lloyd replacing the late Peter Laughner, have recorded and released Rocket Redux, a 12-track disc representing their current set. While it's not officially due for US release until February 24, you can order copies from Smogveil by clicking here. Be sure to use the promo code 'rfttredux' to get free shipping. Russell Baillie of the New Zealand Herald has an interesting review of the Rhino Marquee Moon reissue which you can read here. Interestingly, he mentions that Blondie has been including "See No Evil" in their setlist as recently as their 2003 tour. 1.19.04: So, do the Strokes sound like Television? Not according to the band themselves, who don't even have a single Television album between them. 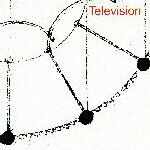 As promised on 12.25.03, you can now download "Bring The Television" from tv.obbard.com. Right click here and choose "Save As.." to begin your download. 1.15.04: Ithaca Journal reviews No Thanks! Jim Catalano of the Ithaca Journal has a review of the No Thanks! box. Additionally, he mentions the Marquee Moon album among his "must-haves from the era". Hank Kalet of the South Brunswick Post, NJ, has some nice things to say about Adventure here. Rolling Stone's critics have named the Marquee Moon reissue several times in their year-end selection of 2003's best. The full list can be found here. Eye Weekly puts the 'mash up' of "Marquee Moon" and Public Enemy's "Bring The Noise" created by Go Home Productions at #3 in their year-end "Anti-Hit" list, which you can read here. Unfortunately, Go Home no longer appears to have the track available for download, but I'll make it available in the next few days. Chris Dahlen of Pitchfork Media has a lengthy review up of the reissues today which you can read here. The Toronto Star's "In Rotation" column this week features Television. Click here to read it. Several days ago, a review of the reissues from Froggy's Delight, "le site web qui excite vos oreilles", was linked to this page. Thanks to the efforts of Emilie Hsu of the Marquee Moon Mailing List, an English translation of that lengthy review is available here! Phillyburbs has a review up of both reissues; they even include specific details about why they like Adventure, which is unusual and great to see. You can read the Television pieces, along with other "Punk rock and roll" reviews by Dave McGurgan here. CNN has a new article on Television which you can read here, entitled "Turning Television on again", featuring a number of quotes from Richard Lloyd. They've also got a piece on the Rhino's new punk-themed No Thanks box set, modestly entitled "The revolution that saved rock", with more quotes from Richard. You can read it here. 11.11.03: Reissues reviewed... in French! Froggy's Delight, "le site web qui excite vos oreilles", has a review up of both reissues and the Old Waldorf disc. You can read it here. I'll try to get an English translation up in the next few days. Update 11.20.03: The translation is now available here. The Richmond Times-Dispatch has an article on the reissues and the Old Waldorf disc which you can read here. Rhino has just published the letter of a grateful fan here. Television just played in LA; read a brief review here. The BBC has a long review of the reissues which you can read here. The Boston Globe has a brief, positive review of the three new Television releases, written by Ty Burr, which you can read here. 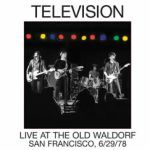 In a week of frenzied sales, Rhino Handmade's recent release of Television's Live At The Old Waldorf, San Francisco, 6/29/1978 has become the label's fastest seller EVER! With expanded and remastered reissues of the band's classic Marquee Moon and Adventure albums and recent reunion performances, interest in this seminal alternative outfit is high. If you've been thinking about picking up this never-before-released live set from the group's '70s heyday, don't hesitate - like all Rhino Handmade limited editions, once Television has been sold out, there won't be any "reruns." I've got 'em, and they are fantastic. Rhino has done a beautiful job and both discs are nearly flawless in terms of sound, packaging, liner notes, and bonuses. The sonic upgrade and extra tracks on Adventure are particularly essential. Maurice Rickard did a great job writing-up the reissues on the Marquee Moon Mailing List. You can read his comments here, here and here. My own comments appear here and here. Thanks again, Rhino! I can't wait to hear Live At The Old Waldorf. Also, Rhino now has a lengthy article on their site called "Tell a Vision: The Unified Field of Tom Verlaine" by Barry Smolin. 9.23.03: The Television reissues are out today! Marquee Moon and Adventure are out and early reports are positive. Remember that Rhino Handmade's Live At The Old Waldorf is an Internet-only release you can order here. You can also listen to samples - it's a big improvement on the old bootlegs! Unfortunately, for those of you in the UK, the release date for Marquee Moon and Adventure has been moved to October 6th. Good news: It turns out that "review copies" of the Rhino reissues aren't really review copies at all, and early negative reports of sound quality issues might be moot. Read this post to the Marquee Moon Mailing List for more information. The CD reissue of Flash Light from Collectors' Choice Music is out now. You can read some of my initial thoughts on the reissue here and my observations on the sound quality here. 8.1.03: Television back in the studio? Richard Lloyd has told Billboard that Television is considering spending some time in the studio. You can read the Billboard.com article here. The latest issue of ICE magazine has a detailed article on the upcoming Television reissues and the Old Waldorf disc. Click here to read it. Also, Rhino/WMG has issued a press release which you can read here. On September 23rd, 2003 both Marquee Moon and Adventure are due to get expanded reissues courtesy of Rhino! This is the best news for Television fans since the band started sporadically touring again in 2001. Both reissues will feature bonus material. Highlights: Marquee Moon will contain the first-ever official CD release of the complete 7-minute "Little Johnny Jewel", Television's first single (originally released across two sides of a 7" inch single in 1975), as well as a number of alternate mixes of tracks from the album. Adventure will include the legendary lost title track and the sought-after 7" mix of "Ain't That Nothin'", among other things. If you're in the UK/Europe, Reflex CD is accepting pre-orders for the reissues! Marquee Moon is priced at £12.99, Adventure at £9.99, with free shipping in the UK. (Shipping is £1 for Europe, £2 for the rest of the world). To pre-order, send an email to Reflex. 7.21.03: Historic Television performance to be released! Also, on September 23rd, 2003 Rhino's internet-only label, Rhino Handmade, will released the oft-bootlegged June 29, 1978 performance as Live at the Old Waldorf. This 66-minute CD will be drawn from the master tapes delivered to Elektra back in 1978 by KSAN, the radio station that originally broadcast this stellar Television performance. This show has been bootlegged for years under titles like Live Adventures, Live in San Francisco, and Portable Electricity, but all have suffered from subpar sound, gaps in tracks, etc. 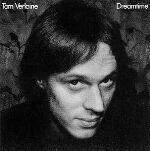 On August 5th, Collectors' Choice Music is due to reissue Tom Verlaine's 1987 solo album Flashlight on CD. Not only is this often cited as Verlaine's best or second-best solo effort, but it's been out-of-print almost since the day it was released, making a reissue well overdue. You can order your copy direct from them here . Collectors' Choice has previously reissued Verlaine's self-titled solo debut and Richard Lloyd's 1979 debut Alchemy. Both are highly recommended.